SunStation EV provides you with an electric vehicle charging system that looks great and makes you money! It provides an aesthetically pleasing charging solution that will attract the growing number of electric and plug-in vehicle owners. Sun Station EV charges multiple cars simultaneously. Options are available for 2 or 6 parking spaces. Larger systems are also possible! The system is grid-tied so that you have power available 24/7 and you make money selling power back to the grid. All you need is a 240 V AC plug. You can easily add more modules as demand increases. The baseline model provides free charging but ChargePoint chargers can be added at added cost, if you want to generate revenue from charging. If you opt for ChargePoint, ChargePoint will manage the charging for you. http://business.panasonic.com/support-hvac-hitsolarpanels-videosYou can also purchase SunStations without charging ports. 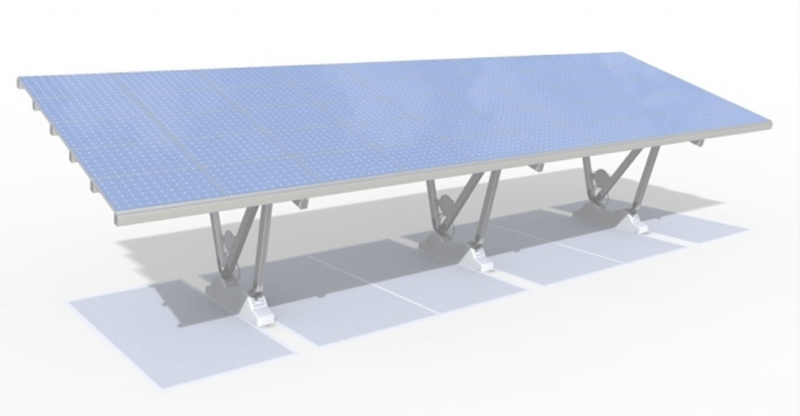 The two car carport with 6.6 kW of Panasonic HIT solar panels is shown below. Videos on HIT panels are available here. We use renewz carports, the most beautiful and practical carports in the industry. The six car carport has 16.5 kW of solar panels. Installation is easy. It takes about 3 hours for the 2 space version and 15 hours for the 6 spaces version. No foundation is required. Maintenance is minimal, no repainting is ever needed. Princeton Satellite Systems manages the solar system and inverter remotely making the system maintenance free. Contact us today for more information or a quote!